I couldn't decided what to title this post, I nearly went with "More than meets the eye", but I figured only my older readers would get that! My husband loves his transformers. Despite the fact that he is in his 30's, these were the toy of the 80's, and from all accounts, he had quite a few of them. In fact he still has some today that he has kept in a box in the garage. One of my favourites he still has is Soundwave - which in the movie was a satellite orbiting the earth, but his classic version transforms into a cassette player! Even the cassette that went into the player transformed, his transformed into the panther, Ravage - which was also in the move, but totally different. Ah I remember cassette players! I know there is a lot of you readers that wont!! The base polish I'm wearing here is the beautiful aEngland Ascalon. It's a purple to green duochrome holographic polish. But there was no sun today, so you wont get to see any of the holo. 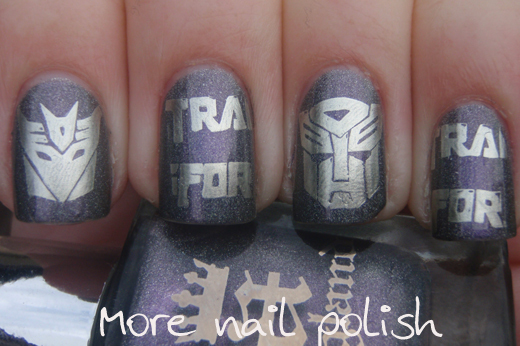 I stamped the three transformers designs (the Decepicon icon, TRAN FOR words and the Autobot icon) using Sally Hansen Canary Diamond Chrome. Oh, that's so sweet. Mr 4 (tomorrow) isn't quite ready for them yet, but we have a stack of them stored away for when he is ready. Maybe try ebay for the plate. 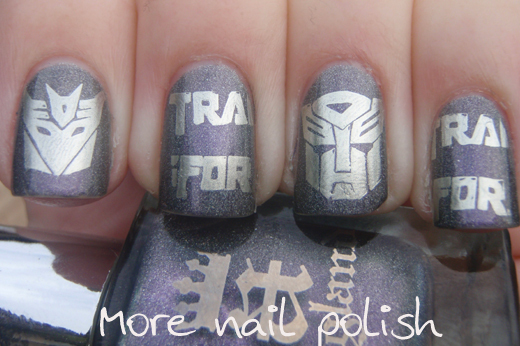 Transformers rock! OMG I LOVE THIS!!! 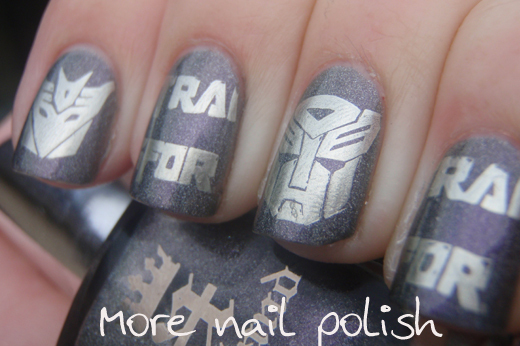 Transformers is the best! Love the 80s cartoon and 80's movie not to mention the new movies rock!! Thank you - I think transformers have quite a following! No doubt I will be placing more Layla orders in the not too distant future. I've heard rumors of some new polishes they are doing. I'll post when I do a group order. Oh I love it! I have a soft spot for robots, and it's so cool that there's a stamping plate for transformers. IRK, I can't believe there is a transformers plate! Looks awesome! I thought about those Layla mirrors too for stamping..but probably on the expensive side for stamping if they are going to run $15.50 a bottle like their other polishes. But I think they will certainly be very cool to stamp over! I'm always looking for some nice metallic colours to stamp with, I really only have two colours, and one is almost empty. The swatches of them look nice. I hope they live up to my expectations. Love it! Transformers is so awesome. I got to ride on the Transformers Ride at Universal Studios in Singapore. FREAKOUT MAN! So so amazing. I AM SO SAD!! Why doesn't she have this plate anymore??! I NEED IT! Holy cow... my hubby would freak if I could get my hands on this plate!!!! Maybe try ebay? My hubby thought it was pretty cool! LOVE IT! Hubby and I are big fans of the Transformers. He is over 40 and still crazy mad for them. We watch the dvds regularly! I just had to get one of these for his sake :) I found it in ebay, under $5 and ships for free, can't argue with that. Yay, you found the plate. I can't believe there is a transformers plate! YAY! I have this plate and I adore it; I'm a huge Transformers fan. When other little girls were watching cartoons of pink and frilly, I was digging Transformers and GIJoe--My husband thinks I'm the best thing since sliced bread. I personally like to rock the Decepticon insignia in Revvvolution (fitting, if you're up on Cybertronian history) over a dark purple creme base. Oh wow, look at you and your knowledge of Cybertronian history! I think I get "more than meets the eye" it's from the song right? I also know what cassettes are. :D I used to listen to them when I was a kid in my portable cassette player thingo. I love the base colour! I saw that our order was here, it was close to where I work! I hope they get to me before the 1st May or I'll have to wait until I get back from holidays to play with them. Yeah - It's the original song! ha ha. I thought you were way to young to have a portable cassette player!! I'm sure you will get the polishes before 1 Nay, it says scheduled for delivery on 26th, but I bet they are here on Monday. That's so cool. 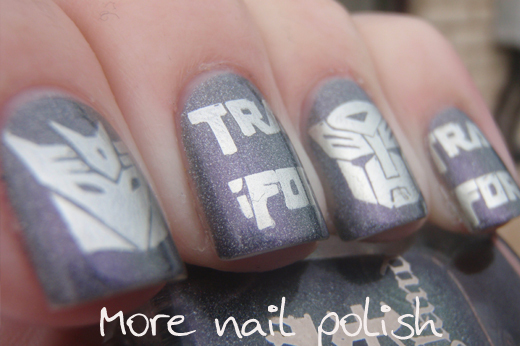 My husband loves Transformers too.